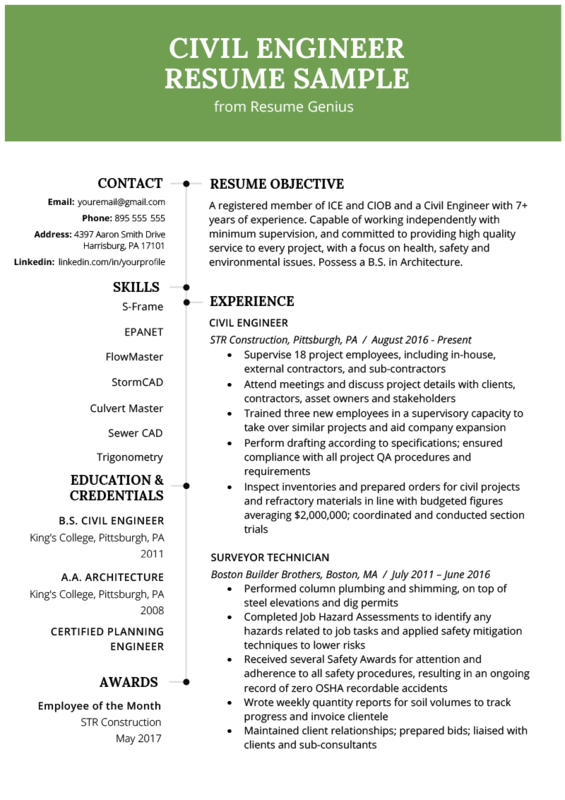 Write the perfect civil engineering resume with the resources below. Download the sample and matching cover letter, then customize them using our expert writing tips. A registered member of ICE and CIOB and a Civil Engineer with 4+ years of experience. Capable of working independently with minimum supervision, and committed to providing high quality service to every project, with focus on health, safety and environmental issues. Professional, capable, and motivated individual who consistently performs in challenging environments. Also possess a BS in Architecture. Pay for different positions within the industry will vary depending on experience level, skill level and geographical location, however Civil Engineers can expect to make a healthy $80,000 per year. Because the general practice of civil engineering requires you to be a “jack of all trades”, the resume tips on this page will be relevant regardless of what your specialization is. Quantification is especially effective if you can prove how much money you stayed under budget through strong negotiation skills, intelligent use of resources, finding cheaper materials to use, or saving costs on unnecessary labor. Your bullet points should be targeted at the job that you are applying for. Therefore, they should not be general, unspecific, and bland. 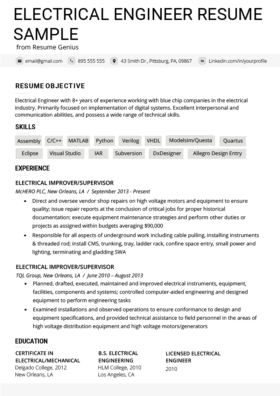 As you can see, the sample also goes into detail about doing survey technician work, so the candidate heavily emphasized his/her skills in this area. Civil engineers need to have a lot of knowledge of math, science, and technical software to do their jobs well. 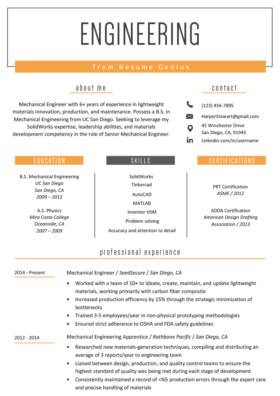 Your familiarity with a host of different engineering software programs will make your resume far more convincing. “Hard skills” like software, tools, and technical knowledge are far more important on a civil engineering resume than “soft skills” like teamwork, communication skills, and the ability to work under pressure. If you do have those “soft skills”, try to emphasize them in the cover letter, or in your bullet points. “Show” that you have those skills by writing about your achievements, don’t just “tell” the hiring manager that you have them. Remember to be honest, however. It would be embarrassing to claim that you know how to use a piece of software, only to fail on the job because you exaggerated. Think carefully about what verbs you are using to begin your professional experience bullet points. The first word is the most importance in the bullet point and thus should be selected specifically for the responsibility being described. Some words are decidedly more managerial, such as “challenged” or “delegated”, while others are more team working oriented like “adapted” and “recovered”. Using the appropriate verb for your appropriate career level is also an important consideration to take into account. Hi Team RG! U pple r really doing a great job. First of all, a big thank you for it. I have a query. What should be the career objective of a person in his resume who is working as construction manager in QUALITY ASSURANCE & QUALITY CONTROL dept having 22 years of experience & wants to apply in other construction companies (e.g. SP construction)??? Thank you for your lovely comment. Glad to hear that we’ve been able to help you out!